The Rose of Nelson was one of four batteaux that helped clean up tires out of the James River during the the "Tire-less James" river cleanup and helped organize the batteau & the VC&NS involvement including location of the cleanup with the James River Association. Over 475 tires were taken out of a 59-mile stretch of the James. The Rose and its crew pulled out Lots of tires- 80 ish, plus lots of other trash, including one giant truck and a huge tractor tire. It was hard, wet, dirty work, but worth it to help keep the river we use clean. It is great feeling to help our envirnoment and inprove the cleanlyness of the James. Go to the "Photos & Videos" page to see more pictures. The crew included: Joseph, Julian, and Paige Maltby; Brian Cofield, Ron and Debbie Hall, Ron and Deanna Sweeney; and Ellen, Mike, Kenny, and Daniel Neal. Batteau Floats through Charlottesville for First Time in over a Century! Update: (Tuesday 26 May) A photo album of this historic Rivanna river trip and a video of us running the Rivanna Mills dam falls have been uploaded, check them out in the Photo & Video Albums section! Stay posted for an article or two about the trip, and see press release below! On May 9, the Rose of Nelson™ Batteau will begin its journey on the historic trade-route connecting Charlottesville with Richmond, the Rivanna River. 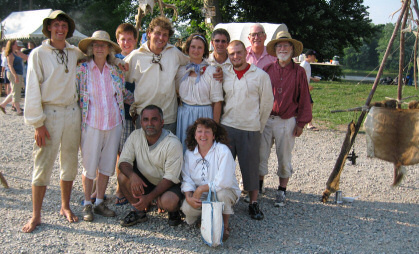 Following the same path as Jefferson’s cargo craft, and passing such historic locations as the site of Jefferson’s mill in Shadwell, The Rose and its crew of 13 local batteau enthusiasts will make its historic trip starting from just below the Charlottesville reservoir and continuing on to Columbia. The Rose of Nelson™ is a hand-built replica of the river-craft popularly used from about the 1750s-1850s for transporting agricultural products to ports such as Richmond. Known as the James River batteau, these boats were designed by the brothers Anthony and Benjamin Rucker. Thomas Jefferson himself testified to being present at their very first batteau launching. Now, over two hundred years later, The Rose, captained by Mike Neal and co-captained by Jacob Neal, both of Faber, VA will recreate a section of what was a trying journey down the Rivanna and James Rivers to deliver plantation crops. The Rose will be traveling by Darden Towe and Riverview Parks on Saturday, May 9 between mid and late morning, where they will be stopping to talk about batteau history and allow spectators to view the boat. The Rivanna River Regatta Canoe and Kayak Races will also be running the River at this time. For more information about the Virginia Canals and Navigation Society or the James River Batteau Festival click the links on our menu to the right of the page. After a long week on the river, we got all the major post-trip work taken care of, the boat was packed in key areas and put back into our pond, all of the canvases and PFDs were dried and folded up then put away, excess food was inventoried and cataloged. This puts us about a week ahead of where we were at this time last year, so thank you to all who helped, both before the festival and after, we really appreciate it! James River Batteau Festival 2008 - Low Water Sucess! I am thrilled to report that the James was sucessfully traversed from Lynchburg to Maiden's Landing, even given the extremely low water on Monday, causing a 13 and 1/2 hour day on the river! The rose, among 8 other boats, made it to Wingina sucessfully right after dark, being the last boat in for the evening. There were 9 other boats which could not make it past the state park, about half way between Galt's Mill and Wingina, and pulled out there and put back in downriver. There was a very nice celebration for Nancy Trout's birthday Monday night, and we also celebrated Jabo's birthday at the same time. The cake went with us on the river and most everyone was able to get a piece of it! Happy Birthday Nancy! We arrived at Maiden's Landing on Saturday afternoon, right around a quarter after five o'clock. Tasty Critters had hot, interesting, and delicious food ready for us all, as they always do, and we were happy to partake and support them! Check out the Photo and Video Albums for great photos and footage of the Rose Crew in action this year! After some time, I am satisfied to have created a professional yet personal website to compliment the Rose of Nelson Batteau, its crew, and the James River Batteau Festival. The purpose of this new website is to improve communication between our boat and its crew and between 'the boat' and the public, providing valuable resources for those interested in the James River Batteau and the Festival. This is just one of our small contributions to preserving an integral part of Virginia's History.